I’m excited about this Clean Eating Kettle Corn, folks! I set out to make a different type of popcorn, and quite by accident ended up making what could possibly be the closest thing to kettle corn a clean eater can get! I love happy accidents like this. The truth is, it’s been so long since I’ve really cooked with any type of dry sugar (I always use honey and maple syrup), that I completely spaced the effect heat would have on the sugar. I forgot how fast it can melt and how great it is for a simple, hard-candy type coating. So when I stirred the coconut sugar into the hot pot, I panicked just a little when I saw the way it melted. In fact, I thought the bottom of my pot was a goner for sure. Thankfully, my pot was saved with a little soak in some hot water and the effect on the popcorn was nothing short of delicious! I highly recommend that you try it with the pumpkin pie spice. It’s not a predominant flavor, but it adds just the right amount of that “brown sugar” flavor that people like so much in kettle corn. This Clean Eating Kettle Corn is perfect for your next movie night! 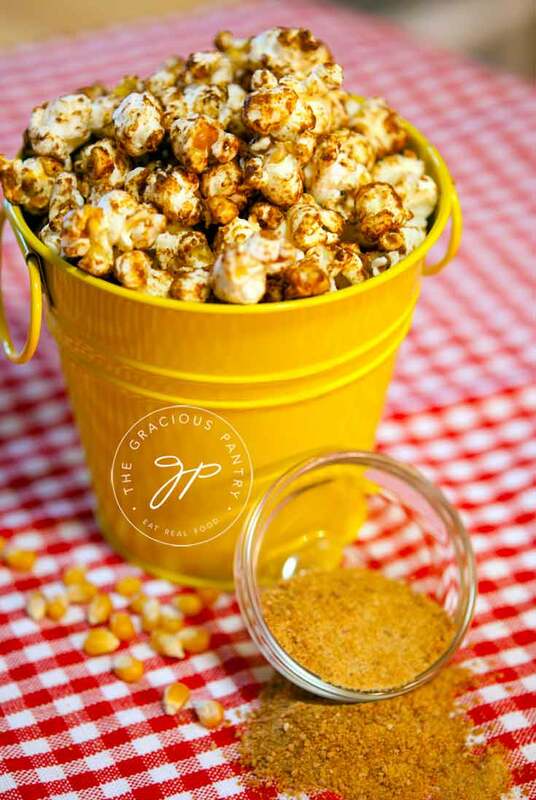 Kettle corn doesn't have to be a guilty pleasure when you make it yourself at home! Prep: In a small mixing bowl, blend together your coconut sugar and pumpkin pie spice (if you are using it) so you have it pre-measured and ready to pour. Set aside. Using a sturdy pot with a lid, melt the coconut oil and then add the popcorn kernels. Cover with lid. Make sure you have some pot holders handy if you need them. Occasionally shake the pot over the flame to avoid burning. When the popcorn is popped, keep the lid on, but remove the pot from the heat. Remove lid and quickly stir in the coconut sugar, stirring with a wooden spoon is best. Stir until the popcorn is well coated. There will still be some white spots on the corn. It should look roughly like the photo above. Once mixed, immediately transfer to a cool serving bowl so the sugar doesn't burn. I’ve perused your blog before, but this is the recipe that will make me subscribe! Thanks for this! We ran out of bags of popcorn that my daughter loves so I decided to teach her to make it “the old fashioned way” but when I reached for the oil, I wondered how it would taste with coconut oil instead but wasn’t brave enough to try it. I melt the oil first to be sure the entire bottom of the pan is coated. Then I drop in the popcorn. Keep the heat somewhere around medium to medium-high. Not on full high because it will burn the popcorn. Awesome, I love kettle corn, is there another spice that you could recommend instead of pumpkin? It’s funny, the pumpkin flavor is not prevalent at all. It sort of caramelizes with the sugar for a nice sort of maple-y flavor. You could experiment with other spices, but I haven’t tried it myself. Okay I just tried this recipe and it was soooooooooooooooo good!! WOW was that amazing! I was a little nervous about the pumpkin pie spice but it was right on and tasted wonderful! I did only use 1/4 tsp of the pumpkin pie spice and it tasted wonderful! I use air popped pop corn. Will it still work? Where do I find coconut sugar? It would probably work okay. You’d have to try it though. Coconut sugar is sold in many health food stores. You can also get it on amazon.com. have you ever heard of a whirly pop? I have one and was wondering if you had any idea if I could do this in it? 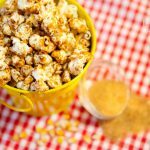 I AM GOING TO HAVE TO TRY THIS WITH GINGER AND WASABI POWDER I HAVE BEEN WANTING A KETTLE CORN SWEETNESS WITH OUT USING WHITE SUGAR AND I HAVE SOME COCONUT SUGAR ON HAND YEA ! !